A manual created by the Center for Educational Technologies to help miners discuss important safety topics earned an award this week from the Mine Safety and Health Administration (MSHA). 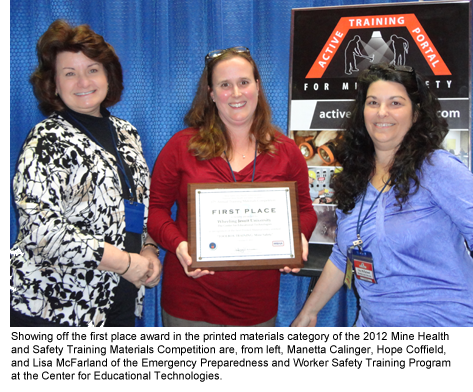 Toolbox Training: Mine Safety received first place in the printed materials category of the 2012 Mine Health and Safety Training Materials Competition. The event kicked off the three-day 2012 TRAM/National Mine Instructors Seminar sponsored by MSHA and held Tuesday through Thursday at MSHA's National Mine Health and Safety Academy in Beaver, WV. The Toolbox Training book features 33 scenarios in 11 general mine safety topics, ranging from avoiding roof and rib collapses in underground mines to guarding against highwall collapses and rollover accidents at surface mines. The team, part of the center's Emergency Preparedness and Worker Safety Training Program, researched 33 actual fatal mining accidents in the United States over the last decade and designed safety training around the common causes of those accidents. The scenarios are organized so that trainers or supervisors at a mine can deliver them in short, roughly 15-minute increments, giving trainers the freedom to have safety discussions at the mine while on the way underground to begin a shift, for example. Each topic features three real life scenarios, questions designed to get miners discussing similar safety scenarios at their mine or prep plant, a wealth of safety best practices around each topic, and illustrations highlighting many of those best practices. Each topic is covered on the front and back of a page to allow for ease of use for both trainers and miners. Janis Worklan, editor and curriculum writer at the Center for Educational Technologies, was lead author. The Toolbox Training was created as part of the Mining and Industrial Safety Technology and Training Innovation (MISTTI) project, funded at Wheeling Jesuit through the National Institute for Occupational Safety and Health (NIOSH). MISTTI has worked to improve the health and safety of miners and other workers by enhancing and facilitating the introduction of new and existing technologies, training, and technology transfer approaches from government and private research facilities into the mining industry. Another manual created by the Center for Educational Technologies through the MISTTI project also received recognition at the TRAM conference. The Dust Management: Protecting Your Health workbook received an achievement certificate. This workbook, also authored by Worklan, highlights health hazards and other dangers dust presents in underground and surface mining, and it offers ways to manage dust effectively. 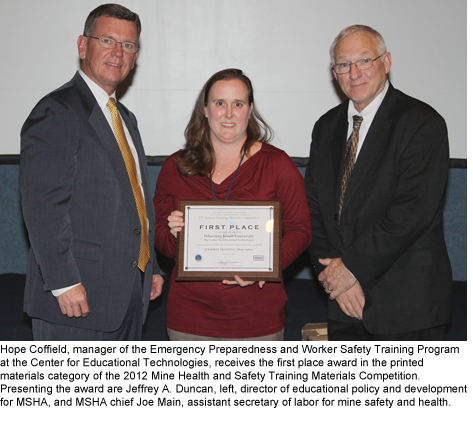 "The Center for Educational Technologies is pleased to contribute to NIOSH and MSHA's efforts to provide improved training resources for mine safety instructors," said Hope Coffield, manager of the Emergency Preparedness and Worker Safety Training Program. "Effective training materials can have a long-lasting, positive impact on the health and safety training at mining operations. The ultimate goal of improved, innovative training is to prevent workplace fatalities, injuries and illnesses." The Toolbox Training and Dust Management books are currently available by contacting Coffield and will ultimately be disseminated through MSHA and NIOSH. Coffield and Manetta Calinger, a curriculum writer at the Center for Educational Technologies, also debuted the Active Training Portal for Mine Safety at the conference. Developed through a $144,000 MSHA grant from the Brookwood-Sago program, the Active Training Portal is developing, implementing, and evaluating a 16-hour train-the-trainer course that applies active learning to underground mine emergency prevention and preparedness. Active training, which turns the spotlight away from the instructor and emphasizes the learner—has emerged over time as a reliable method for enhancing understanding, and retention of information, critical thinking, and decision making, Coffield said. Coffield and Calinger's presentation introduced emerging training materials and resources to apply active learning to underground coal mine emergency prevention and preparedness. Their session provided examples of strategies for topics such as coal dust and ventilation hazards. The Academy for Mine Training and Energy Technologies at Southern West Virginia Community and Technical College is a partner on the Active Training Portal. In addition to the mining safety efforts featured at the conference, another NIOSH-funded project at the Center for Educational Technologies is examining ways to improve how research on mining safety gets disseminated to the mining community. Besides MSHA and NIOSH, the Emergency Preparedness and Worker Safety Training Program has also provided services to the U.S. Army Corps of Engineers, the U.S. Environmental Protection Agency, and the International Union of Operating Engineers National Training Fund, National HAZMAT Program.